Superman first appeared in Action Comics #1 in 1938. The rest is history, and it's been described ad infinitum in countless other places, so I won't bother going over it here. What I find more interesting is what happened before Superman's debut. It's very likely - though it was not, to my knowledge, ever officially acknowledged - that Superman's creators, Jerry Siegel and Joe Shuster, were inspired by a novel titled Gladiator by science fiction author Philip Wylie. The novel centers around Hugo Danner, a young man who is born with fantastic powers after his father, a biochemist, secretly injects his pregnant wife with a special serum as she sleeps. Like Superman, Hugo has immense strength, invulnerability to bullets, and is able to leap great distances (initially, Superman could only "leap tall buildings in a single bound" - the flying came later). Hugo tries to fit in to society and, at times, use his powers to either his own advantage or that of the world's, even enlisting during World War I. Eventually, however, Hugo's powers drive him into isolation and, eventually, despair. Gladiator encapsulates almost every theme that would later be explored by the better Superman writers - and then some. It's a brilliant, poignant work, and it's a shame that the novel - and Wylie himself - have largely been forgotten by all but the most snooty pop culture geeks (such as myself), while their greatest scion, Superman, has become a cultural icon and, in many ways, the first truly American myth. For all the fuss over Siegel and Shuster not receiving money from DC Comics for decades as the company built its reputation on Superman's broad back, it's worth remembering that allegedly, before the two men decided to bring Superman to Detective Comics, they shopped it to many newspapers, who turned it down fearing a lawsuit from Wylie's publishers due to the similarities to Hugo Danner. Without Gladiator, there may have been no Superman. Just recently, DC's Wildstorm published a miniseries titled Legend based on the novel, though writer Howard Chaykin brings the story forward fifty years to make the parallels to Superman even stronger. But Superman is not Hugo, and while Superman may owe more than a fair share of his origin to Wylie, he owes just as much to every other mythological character in history, from Gilgamesh to Robin Hood, and his status as an American cultural icon is both well-deserved and fascinating. Being a superhero - arguably the Superhero - Superman has been honored by many, many toys over the years. 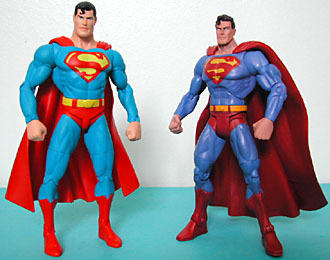 In terms of action figures, many of today's collectors will remember the Mego Superman of the 1970s, the Kenner Super Powers figures of the 1980s, the Kenner/Hasbro animated figures of the 1990s and Mattel's Justice League line. 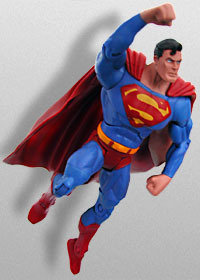 More recently, Superman has been honored with myriad DC Direct figures. 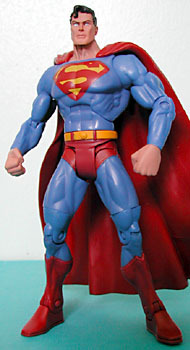 The finest of these was 2002's basic Superman, part of a Superman-based line that included a purple Bizarro and Braniac 13 in his amazing bike shorts. 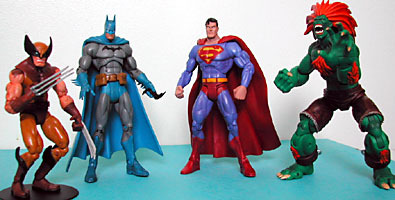 Mattel scored the mass-market DC license in 2003, though it pertained only to Superman, Batman, and the animated Justice League and their respective rogues galleries. That's as far as their license currently goes, but it was a lucky break for Mattel; their Masters of the Universe line had tanked after only a year, and they needed to make up some of the boy's toys market. This being Mattel, they made more than a few stumbles along the way. In the initial waves of the comic-based Batman line we got goofy variations, too few villains, and production issues. Two of the best figures, Bat Signal Batman and Armor Attack Batman, were only released overseas(!). Collectors were horrified; hope was a scarce commodity. Mattel, it seemed, was back to the tricks that had sank the MOTU line. Despite having the excellent Four Horsemen on board to sculpt the line, Mattel repeatedly disappointed collectors and fans (though it's entirely possible that kids, the true target of the mass market, were pleased as punch). 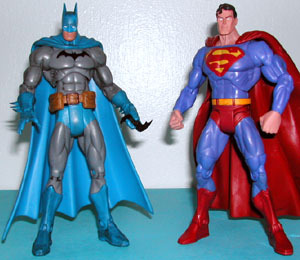 There was a previous Mattel comic-based Superman figure in a two-pack with Batman, but the Superman figure wasn't sculpted by the Horsemen, and the figure itself was less than impressive. Then something interesting happened. Last year, DC announced they would be revamping the Batman line as a "DC Superheroes" line, which would switch off between Batman, Superman and their respective "families" and villains. The company showed off figures that sported articulation that rivaled other superhero properties on the market, such as Marvel Legends and SOTA's Street Fighter. Hope sprung anew. The first wave, comprising Batman, Bane, Killer Croc, and Scarecrow - that's right, one Batman and three villains - was mostly a rehash of sculpts from the comic-based Batman line, though most had at least one new part. The Batman was pretty good, but the articulation wasn't quite up to snuff; he didn't have the all-important balljointed head, nor were his hips balljointed. Now the second wave, featuring Superman, Supergirl, Doomsday, and Bizarro (a very similar line-up to DCD's first two waves), is hitting stores. And it looks like Mattel has learned a lot since wave one. First off, I'm very fond of the packaging design. The generic "exciting" graphics pop at you from the racks. They're colorful - all oranges and yellows, with a bright white logo and a paper insert that makes it look like he's breaking a chain - and call up fond memories of Kenner's Super Powers. In fact, that's what the DC Superheroes line is - a modern Super Powers, featuring state-of-the-art sculpting and excellent articulation. And Superman is the ideal flagship figure for the line. First off, this is my favorite Superman sculpt on an action figure so far. Unlike the DC Direct figures, this sculpt of Superman isn't based on any specific artist's work (even the basic DCD Superman appears to be in the style of Ed McGuinness, or maybe Curt Swan). This is the Four Horsemen's interpretation of the Man of Steel, and it's an excellent "generic" comic-based Superman. His facial features can only be described as "chiseled," and while he does have a touch of the Ronald Reagan looks that seem to creep into many Superman depictions, it's not nearly as obvious as in, say, the DC Direct Dark Knight Returns Superman. The famous curl is in place, and the hair is lovingly detailed; the blue eyes give him a mien of strength and determination. The muscle definition is perfect, though I've noticed that there's a distinctive blocky look to the way the Horsemen (or at least one of them) sculpt shoulders - compare Supes's shoulders to that of the revamped He-Man. Even the wrinkles on his underoos and the edging along his boots are marvelously sculpted. The figure's sculpt is an exquisite balance of detail and simplicity. It's easily one of the Horsemen's best pieces. It should be noted that Supes's cape doesn't have the yellow "S" on the back. Also, the blue and reds on the costume seem a little darker than they usually appear in the comics; I suspect this was to make Supes more closely resemble his upcoming movie counterpart. Thankfully, the "S" on his chest is nice and large. Speaking of the cape, it's made from a rubbery plastic, another sign Mattel is learning from past mistakes. The cape is sculpted in a loose flowing shape, and looks good both at rest or in a "flying" position. Any sculpt can be ruined by poor paint applications, and Mattel's record is a bit shaky in this department. The basic Batman in the first DCSH wave had an odd dark wash that just made the figure look dirty. Thankfully, Superman is wash-free, matching his squeaky-clean image. There are only a few paint applications; mainly the "S" on the chest, the belt, the underoos, the boots, and the hands and head. There is some small bleed on my figure around the top of the boots and around the edges of the hair, but compared to other 6" figures (including Marvel Legends), I'm impressed by how well Mattel did here. It's no secret that I'm a diehard fan of articulation, and I can happily say that this is the first Mattel figure of recent years (aside from Armor Attack Batman) that doesn't disappoint. Supes has the all-important balljointed neck, though admittedly it's slightly limited - he can't really turn his head entirely upward (or "forward" when flying), but it's sufficient. He also has balljointed shoulders, a peg waist, peg biceps, wrists and thighs, a hinged torso, and hinged elbows, knees and ankles, for a total of about 21 points (with the hips counting as four total, owing to their complex design). The ankles also move slightly from side to side, but it's limited. The hip articulation is a variation on the "balljoint" hips of the MOTU figures, but works more or less the same way while allowing for a bit more forward-and-back motion. The peg thighs don't look too bad when bent, and allow for the tiny bit of adjusting necessary for some heroic poses. The bicep articulation, on the other hand, is perfectly integrated into the sculpt, as has become the industry norm for superhero toys. More than any point of articulation, it's the balljointed head and hinged torso that make this figure. These two points allow for the best flying poses ever on a Superman figure. I've seen some other photos of this figure on the internet that seem to have a very wide stance. Superman's legs are indeed set apart for a heroic pose, but it's not nearly as extreme as some of the examples I've seen elsewhere, and I have no dissatisfaction with my figure in that regard. Supes isn't quite in scale with Marvel Legends or Street Fighter. He's a little short, but I blame this more on the creeping height of ML (and thus SF) than on Mattel. Superman is in a good 6" scale; everything else is just a little tall. More troubling is the fact that Batman seems to be just a smidgen taller than ol' Clark Kent, which shouldn't be (even with the cowl). But it's a really a small flaw in an overall excellent figure and toy line. Seeing as how this figure's MSRP is around $9, it does have one flaw: no accessories. C'mon, Mattel, you couldn't even give us a piece of Kryptonite? But given how great the rest of the figure is - and the high cost of creating action figures in the current market - I'm willing to let it slide. 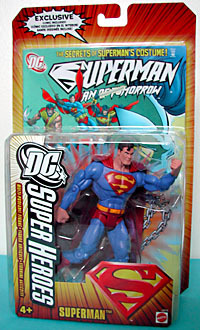 Like the rest of this toys in the line, Superman comes with a comic - Superman: Man of Tomorrow #9, which seems to be some sort of revised history of the character. I'm afraid I didn't find it terribly interesting, but it's good for the kids to get something about the character when they get the figure. One final note. I haven't actually "played" with an action figure since the days of the original Teenage Mutant Ninja Turtles in the late eighties. I do open all my toys and will pose and re-pose them endlessly, but I won't actually play with them. However, I find myself bringing this figure into my living room while watching television or hanging out with my girlfriend, posing him in various positions - flying, smashing a wall, kneeling beneath the assault of an imaginary Kryptonite block, hovering in space. While I was more than impressed with DC Direct's Superman a few years back, this one blows it away. This is everything an action figure should be, and the Four Horsemen and Mattel should be proud. Who made your favorite Superman? Tell us on our message board, the Loafing Lounge.